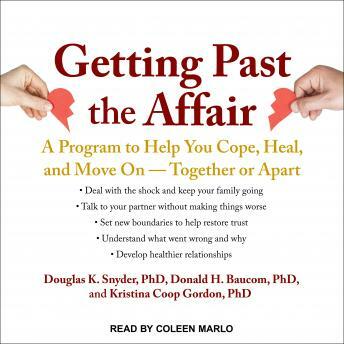 Written By: Kristina Coop Gordon, Ph.D., Donald H. Baucom, Ph.D., Douglas K. Snyder, Ph.D.
Discovering that a partner has been unfaithful hits you like an earthquake. Long after the first jolt, emotional aftershocks can make it difficult to be there for your family, manage your daily life, and think clearly about your options. Whether you want to end the relationship or piece things back together, Getting Past the Affair guides you through the initial trauma so you can understand what happened and why before deciding how to move forward. Based on the only program that's been tested-and proven-to relieve destructive emotions in the wake of infidelity, this compassionate book offers support and expert advice from a team of award-winning couple therapists. If you stay with your spouse, you'll find realistic tips for rebuilding your marriage and restoring trust. But no matter which path you choose, you'll discover effective ways to recover personally, avoid lasting scars, and pursue healthier relationships in the future. by Kristina Coop Gordon, Ph.D., Donald H. Baucom, Ph.D., Douglas K. Snyder, Ph.D.